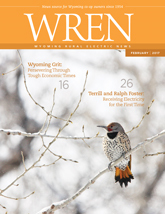 The WREN Magazine is the official publication of the electric cooperatives of Wyoming. Concern for the community has been a part of the electric cooperative spirit since they first turned on the lights. In addition to providing reliable and affordable electricity to Wyoming residents, the state’s electric co-ops are committed to supporting the health and development of the communities they serve. From information campaigns to youth programs and scholarships, the WREA and its member utilities invest time and resources to make Wyoming communities flourish. Individuals interested in applying for funds should contact their local Salvation Army, or call toll-free 1-877-461-5719 to determine their local Salvation Army field representative. The WREA Suppliers Group is made up of vendors that provide services and equipment to the Wyoming cooperatives.